Whether you live in a rural, suburban, or urban neighborhood, you have to admire the French Bulldog’s adaptability to various environments. These pint-sized pups will be happy whether you have a house with a backyard or a studio apartment downtown. Frenchies are able to make themselves at home with single humans or bustling families—as long as they aren’t left alone for long periods of time! The breed’s history begins not long ago, in the 1800s. According to the French Bull Dog Club of America, English lace makers desired diminutive size and bred bulldogs until they got that lapdog size. Soon after, some of those lace makers migrated to France where the breed gained popularity. Americans who traveled to France in that time are responsible for bringing the pint-sized pups to the United States! 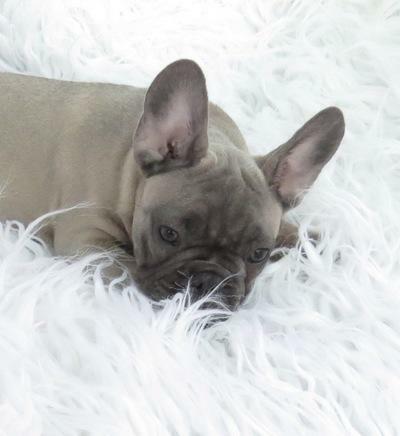 If you’re thinking about getting a French Bulldog or just want to learn more about them, we welcome you to read on below and find out more about their delightful personality traits, how to care for a Frenchie, and potential health issues to be aware of! Some dogs are all bark and no bite. Frenchies rarely do either! They’re known for being quiet but attentive companions who keep a watchful eye over their beloved humans. Don’t get the wrong idea and think they’re too serious though, playfulness is actually one of the traits they’re most known for! Frenchies are affectionate and clever, but are also known for their stubborn streak. They’re playful so be prepared to exercise your patience during training. Speaking of exercise, French Bulldogs really don’t need much. If walking several miles a day with a canine companion seems to be a challenge for you, the Frenchie might be more your pace. A word of caution, though: French Bulldogs are not adept swimmers and should be kept away from open water. The danger comes from them being a brachycephalic breed, or as we say colloquially, they have “smooshy” faces. It also makes flying problematic for them too. Taking care of your Frenchie won’t involve a significant amount of grooming because of their short, easy-to-manage coats, but it will involve some temperature regulation. French Bulldogs are very heat sensitive (thanks to that smooshie face again) but if you live in a cooler climate you may need some pup sweaters in the closet. If you don’t have central air conditioning and heating, getting a French Bulldog may not be right for you because of this sensitivity to temperature. Other possible health concerns often involve the respiratory system, but you’ll also want to be watchful for hip dysplasia and disk disease. Regular checkups will help you keep your Frenchie healthy and if there is something to be concerned about, you’ll catch it much sooner. If the breeder was responsible, and you take good care of your dog, you don’t need to be scared away from these charming little pups! You can find a French Bulldog to adopt from a breed specific rescue or purchase one from a responsible breeder. Once you have your new furry family member, be sure to call NOVA Pets at (703) 378-9791 to arrange an examination, and don’t forget to check out our wellness plans to help save you money for more pup sweaters!